complete with shouts of "woo hoo!". I decided I wanted to finish something today, so I put in the first season of The Big Bang Theory (which has unequivocally replaced Gilligan's Island as my all time favorite televison comedy) and made myself comfy on the sofa. It only took 17 commercial-free episodes to finish the quilting. Now it just needs a binding, but wow, my fingers are sore. Oh, and I'm a new Big Bang fan. A friend who insisted we needed to see the show loaned us the first and second seasons on DVD a couple of weeks ago. I haven't seen the third season, so no spoliers please. I pre-ordered it on Amazon, but there's no release date listed. It hope it's released soon so we can catch up before the fourth season starts. Looks beautiful, Melanie. Any chance of a hand-quilting tutorial/video...I'd love to learn! What a beautiful quilt! :o) You did a great job! My hexagons came in and so far I have a little over 100 done! :o) Oh boy, you are right, they are addicting. I was curious if you use strictly stash fabric of your own, or do you purchase specifically for your hexagon quilt? I hope that you are having a wonderful weekend. I'm just getting ready to start hand quilting my Little Folks quilt - all 72x72 inches of it. I think I'll try and log my hours, too, but mine will probably be measured by reruns of Frasier! Fabulous....I have the finishing bug too. I haven't finished anything this week, but I'm picking away at it. Thanks for the inspiration....I quilted all last summer to Gilligan's island, but I love Big Bang....maybe that is what I need to get moving a little faster!! Hi! I discovered your blog a little while ago & love it! I see you love hexagons, me too! I'm hosting a little hexie giveaway on my blog & I'd love for you to check it out. SO...I am completely jealous that you got to do the happy dance! I haven't completed anything in a couple of weeks and it's making me a little crazy! 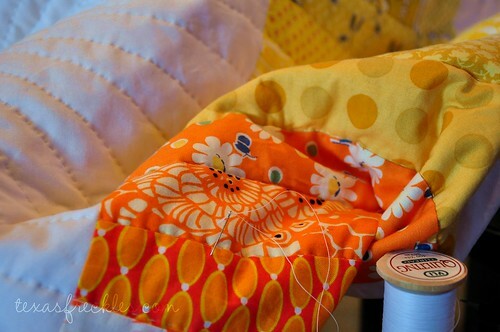 :-) I agree with Barb, you definitely need to make a hand quilting video tutorial for us visual learners. Yep, yep...I think that's a fantastic idea. As for hexies, I had ordered 600 1" hexies about a month ago but the company missed my order and never sent them (I had them refund me). Meanwhile, I had found a website with printouts of the hexies so I have been cutting them out and sewing them. Lots more work but I actually enjoy cutting the paper, too! So glad you made the tutorial for the hexies...I am definitely going to enjoy piecing them this summer during our vacations!! Okay, just wrote a novel here but really, the new quilt looks super! Happy dance, happy dance!! I need anything else etc. Your quilt looks lovely. 17 episodes! I'm guessing that's about 8 hours of TV... and quilting! What bliss! Can't wait to see what you've been working on. Love the project you're working on! And I LOVE Big Bang Theory! My husband and I just binged on seasons 1 and 2 ... we gulped them down like candy. What an awesome, hilarious show!